An almost comical quest to prove the non-existence of a toilet in the Lake Horowhenua rowing club building has resulted in Maori activist Phil Taueki going to ground pending his appearance in the Levin District Court later this week. 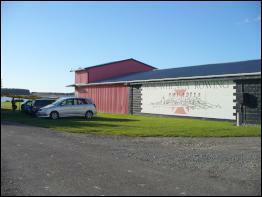 The Levin Rowing Club building beside Lake Horowhenua. A partial toilet was found behind the top left hand window (click for big versions). Meanwhile the Levin Police have confiscated a camera with pictures taken inside the building by Mr Taueki’s companion Bryan Ten Have of a disconnected toilet. Sergeant Willy Roy of the Levin Police has advised Mr Ten Have that he cannot have the camera back. After arresting him and initially threatening to have him charged with burglary they have now released him with a warning. 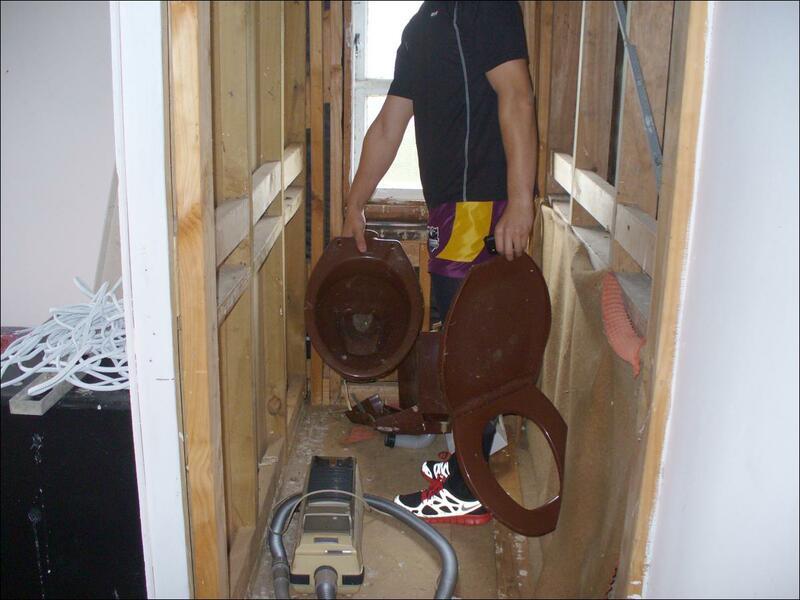 Nevertheless we can In fact show a picture of the toilet – which the Mayor of Horowhenua District Council Brendan Duffy – claimed was in the building at a Maori Land Court Hearing last Wednesday. As you can see the toilet is not connected to any piping. Bryan Ten Have told Scoop he believed he had a right to go into the building after being told he had permission by Lake Trustee Vivienne Taueki, Mr Taueki’s sister. 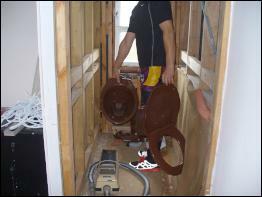 Mr Taueki and Mr Ten Have were spurred to go to the building to take pictures of the alleged toilet as a result of evidence presented by Horowhenua Mayor Duffy to the Maori Land Court in Palmerston North last Wednesday claiming that there was a toilet in the building. During this hearing Mr Taueki had raised various concerns, including the lack of toilet facilities in the building which is on Maori Land and is occupied by the Rowing Club. Mr Taueki said that when the Club holds regattas on the lake, men urinate up against trees and women squat in the bushes. Mr Taueki considered this behaviour to be highly offensive, particularly so close to the burial site of his ancestors many of whom died in the lake. In the witness stand on oath, Horowhenua’s Mayor Brendan Duffy disputed Mr Taueki’s claim that there were no toilets in the building. Judge Harvey is due to make a visit to the site in eight weeks time to determine for himself whether there is in fact a toilet there or not. Mr Ten Have says they found and photographed a toilet seat in the building – but it was not connected to anything. He said he understood from Mr Taueki (who we could not speak to as he is on the run) that there was a plan some years ago to build showers and toilets but these plans were never completed. When the police arrived at the scene acting on a complaint from a member of the boat club they arrested Mr Ten Have but My Taueki had by that time already left to attend a meeting. Mr Taueki faces charges of wilful damage and threatening behaviour this Thursday in a hearing set down for the Levin District Court. He will be represented by Victoria University media law specialist and blogger Steven Price. Scoop intends to cover the proceedings. The charges relate to two alleged incidents last September 13 and 14 arising from complaints made by Noel Procter, the father of Lake Trustee Dr Jonathon Procter who had earlier in 2011 trespassed Mr Taueki from his home on his own land adjacent to the lake. On the basis of this trespass notice, the police had woken Mr Taueki at 1am one morning last June, and taken him down to the police station to charge him with wilful trespass. Mr Taueki was banned from returning to his home and going anywhere near Lake Horowhenua until his trial eight weeks later. At this trial the Judge dismissed the trespass charge the ground that the trespass notice was invalidly issued by Mr Procter acting outside of his authority as chair of the Lake Trust. The September complains occurred two weeks after court proceedings taken by Phil Taueki and two trustees to have Dr Jonathan Procter removed from the Lake Trust as a trustee were heard in the Maori Land Court. Dr Procter – a volcanologist – was not removed from his position. The case has been appealed to the Maori Appellate court, and was heard in February. In the first incident it is alleged that Mr Taueki committed wilful damage to Mr Procter’s wing mirror. Mr Procter was parked outside Mr Taueki’s home at the time of the alleged incident. The threatening behaviour charge relates to an alleged incident the following day – in which Noel Procter is the complainant also. Mr Taueki attended a formal ceremony at nearby Lake Papaitonga where Minister of Conservation Kate Wilkinson was in attendance. Mr Taueki denies both allegations. Friday’s incident is the latest in a long-running series of incidents as Mr Taueki tries to establish his right as an owner to protect the lake from those who abuse what he considers to be the privilege of public access. 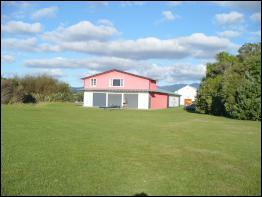 Lake Horowhenua and environs belongs to and has always belonged to Mr Taueki’s iwi, Mua-Upoko. Mr Taueki is the direct descendent of Taueki who signed the Treaty of Waitangi as paramount chief of Mua-Upoko. The lake is very sacred to Mua-Upoko as it is the site of a revenge massacre of the tribe by Te Rauparaha who had threatened to exterminate the tribe. (The legendary All Black Haka “Ka-Mate Ka-Mate” was recounts Te Rauparaha’s intention to avenge the actions of the Mua-Upoko.) There are some who dispute this. When approached by the Crown a century ago, Mua-Upoko refused to sell the lake. As a compromise to avoid confiscation of their ancestral home, legislation was passed placing control of the lake into the hands of a Lake Domain Board appointed by the Governor, and in more recent years the Minister of Conservation. To access the lake, members of the public must cross Maori Freehold Land. Despite the fact that the Crown neither leases this land nor has paid the owners any compensation for the use of their land, the Crown has leased portions of this land to organisations such as the Horowhenua Sailing and Rowing Clubs for clubrooms. At court in Palmerston North last Wednesday the Department of Conservation gave evidence that the lease for the Rowing Club expired several years ago. According to Mr Tenhave DOC acknowledged during these proceedings that under the terms of that lease the building reverts back to the owners of the land. Counsel for DOC then claimed that DOC – via the Lake Domain Board that they administer – has control over who is allowed to go into the building and suggested that a peppercorn rental might be a possibility. Lake Trustee Vivienne Tuaeki says she feels somewhat responsible for the toilet photography incident going to horribly wrong as she was going to arrange permission for Bryan Ten Have to be there. To compound the grievances for the Mua-Upoko owners, the once-pristine lake and generous kai basket is now rated by NIWA as one of the ten worst lakes in the country. Dr Max Gibbs from NIWA recently stated that the water is so toxic that a mouthful could kill a child or animal. Dog owners have in fact been told to keep animals clear of the lake to avoid them becoming ill and possibly dying. In Mr Gibbs report to the Horizons regional council last February, he stated that the danger to the lake from the introduction of exotic weeds is that the aggressive growth habits would irreversibly change the water quality and character of the lake. Levin’s stormwater drains into the lake, and for thirty years from the 1950s to the 1980s treated effluent from town’s wastewater was also discharged into the lake. Horizons confirms that there are still periodic overflows into the lake. Mr Taueki’s actions to protect the lake first came to police attention on 14 September 2008, when he tried to remove Horowhenua Sailing Club members who were launching unwashed boats into the lake. He was arrested on three counts of assault which are currently subject to appeal, and will be heard by the Court of Appeal on 15 May this year. As it was relevant to these charges, Mr Taueki filed an application in the Maori Land Court on 7 January 2009 to determine ownership of the buildings on Maori Freehold Land that the Sailing and Rowing Clubs continued to occupy. These leases had expired in 2003 and 2007 respectively. This matter was finally heard by the Maori Land Court at a special two-day sitting in Palmerston North last week. As fixtures under existing land law, ownership of these buildings passed upon expiry of the lease to the owners of the land, being the Maori owners. It was at this hearing that the mystery of the Rowing Club toilet arose as recounted in the introduction to this story. Mr Taueki had raised various concerns, including the lack of toilet facilities in the building still occupied by the Rowing Club. In the witness stand on oath, Horowhenua’s Mayor Brendan Duffy disputed Mr Taueki’s claim that there were no toilets in the building. After first contacting his sister and Lake Trustee Vivienne Taueki to let her know what he planned to do, Mr Taueki and Mr Ten Have decided to take a quick look inside the building and take some photographs. Upon confirming there were no toilets in the building, Mr Taueki then went on to a meeting while Mr Tenhave remained to take other photographs Mr Taueki needed for Thursday’s court case. A rowing club member contacted the police. Arriving in four police cars, the police arrested Mr Tenhave on a burglary charge, confiscating his camera. Mr Taueki was visible in one of these photographs. When Mr Taueki’s sister, a lake trustee, heard there been an arrest down at the lake, she went down to speak to the complainant and the police. Ealier this week Police were visiting homes throughout the Horowhenua district searching for Mr Taueki to jail him on a technical breach of his bail conditions. It would appear that the police are intending to use photographs taken by Mr Ten Have showing Mr Taueki at the property as evidence of this breach. At present Mr Taueki is barred by his bail conditions from going to buildings beside the lake other than his house. He is only able to go to his house between 9.30am and 12pm each day. Mr Taueki had earlier sought a variation of these current bail conditions which once again banned him from the lake. According to Mr Taueki these oppressive conditions make it impossible for him to live in his house, do his work, or monitor the lake which he considers he is a guardian of. In the Levin District Court this week, Mr Taueki will be represented by Steven Price, while Felix Geiringer will be handling his appeal in May. Meanwhile, Mr Taueki has still not been charged with any offence relating to another incident in which he was led away in handcuffs from an Armistice Day commemoration at the Foxton RSA where he is a member. Horowhenua MP Nathan Guy was in attendance at the event. In this incident police tapped him on the shoulder as he was speaking to a relative. Mr Taueki offered to leave to avoid spoiling the occasion for returned serviceman, but was told he had to wait until police reinforcements arrived from Levin. Eventually several cars of police officers arrived and Mr Taueki spent the remainder of the day in the police cells. AUTHORS NOTE: Alastair Thompson is Scoop’s editor. Investigative journalist and author Anne Hunt is Mr Taueki’s partner.